TIME SPACE EXISTENCE, European Cultural Centre, Marinaressa, Venice. Exhibition open to the public until the 25th November, 2018. Work on display: 'Ascent', Helaine Blumenfeld OBE. Patinated bronze. 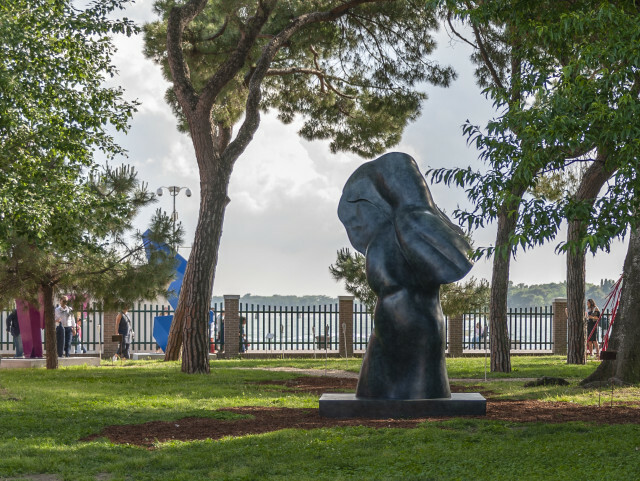 "When confronted... by the monumental bronze, Ascent, I allowed myself to say that I could read the work, from one viewpoint, as a figure of the artist, standing, bent slightly forward, with an angel/ muse on her back." -Alan Caine, lecturer in Art History at the University of Leicester. Previously exhibited at Het Depot Sculpture Gallery, which houses a unique public collection of contemporary sculpture based on the theme of the torso. The European Cultural Centre aims to create dynamic spaces, giving existence to centres dedicated to European culture. It intends to cherish differences and strengthen our cultural commons. Click her for website link.